In everyday parlance, "inhibition" suggests repression, tight control, the opposite of freedom. In medicine and psychotherapy the term is commonplace, its definition understood. 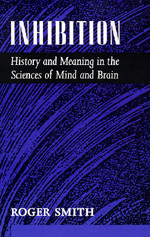 Relating how inhibition—the word and the concept—became a bridge between society at large and the natural sciences of mind and brain, Smith constructs an engagingly original history of our view of ourselves. Not until the late nineteenth century did the term "inhibition" become common in English, connoting the dependency of reason and of civilization itself on the repression of "the beast within." This usage followed a century of Enlightenment thought about human nature and the nature of the human mind. Smith traces theories of inhibitory control from the moralistic psychologies of the early nineteenth century to the famous twentieth-century schools of Sherrington, Pavlov, and Freud. He finds that the meanings of "inhibition" cross disciplinary boundaries and outline the growth of our belief in the self-regulated person. Roger Smith is Senior Lecturer in the History of Science at Lancaster University, England. He is the author of Trial by Medicine: Insanity and Responsibility in Victorian Trials (Edinburgh, 1982) and co-editor (with Brian Wynne) of Expert Evidence: Interpreting Science in the Law (Routledge, 1989).